Keynotes: Michal Grover-Friedlander, Paul Elliman. Presentaties / presentations: Hannah Bosma, Kris Dittel, Brigitte Felderer, Jelena Novak, Veronika Witte, Katarina Zdjelar. The symposium Installing the Voice focuses on the ways in which contemporary artists, composers and performers reinvent the relationship between the body and the voice. There is hardly any other artistic genre where the voice is more essential than in opera. Yet the operatic singing body was long taken for granted and overlooked. Installing the voice, in the framework of music theatre and especially of an exhibition, can be a strategy to make the voice manifest, give it a place, put it into position, and set it up for analysis or experimentation. This one-day event is a collaboration with Operadagen and gathers both researchers in the emerging field of Voice Studies, Musicology, Opera Studies and Cultural Theory, and artists who explore the singing body in contexts beyond opera. The participants will address topics related to staging the voice, the cultural history of the human voice, the emergence of singing and speaking machines, the voice in the post-human era, and vocality and power. On the occasion of the symposium, an essay on Post-Opera by Kris Dittel and Jelena Novak will be launched and made available via TENT’s website. Free admission, registration required via this link. 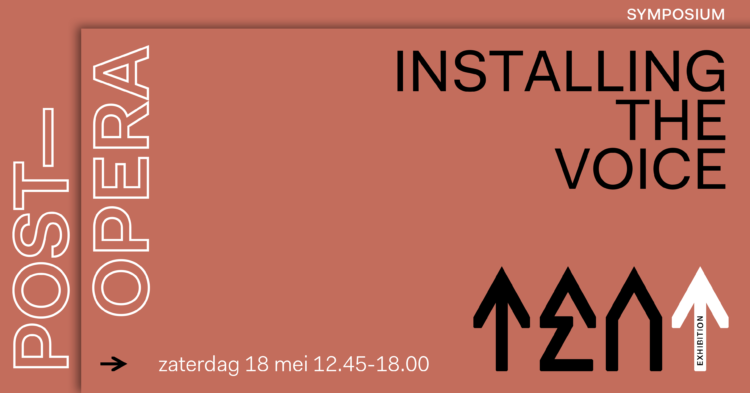 Location: TENT, Witte de Withstraat 50 in Rotterdam.